How to get the right screening for you? How could a genetic test affect your insurance? 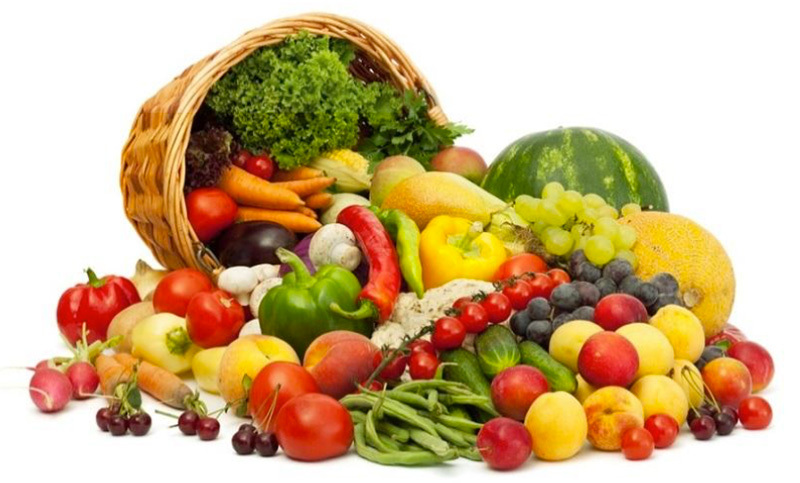 Eating a balanced diet, with plenty of fruit and vegetables and less meat, is advice we are used to hearing, but why? There are lots of factors that influence our risk of cancer, our age, our genes, but also how we live our lives. The risk of most cancers appears to be reduced by a balanced diet which has lots of fruit, vegetables and fibre and less meat. Bowel cancer is one of the cancers most clearly connected with our diet, even when you have an increased risk of it. Research into what things change cancer risks in people with a higher risk of bowel cancer (e.g. Lynch syndrome) shows that there are many factors that reduce or increase risk. These are the same factors that alter cancer risk in most people. Taking HRT reduces the risk of womb cancer. The InSiGHT website provides a good summary of Lynch syndrome, FAP and other syndromes with an increased risk of intestinal cancers. Their site provides links to the scientific evidence which gave us the information on lifestyle factors which alter risk. Why does diet change cancer risk? We don’t fully understand how the different factors work together. However, cancer starts from the genetic material (DNA) in cells changing so that cells stop working in the way they should. This means that anything that damages the DNA in cells is likely to increase the risk of cancer. Looking at it a different way, eating food which reduces DNA damage should also reduce cancer risk. Why should we only eat small amounts of red and processed meat? 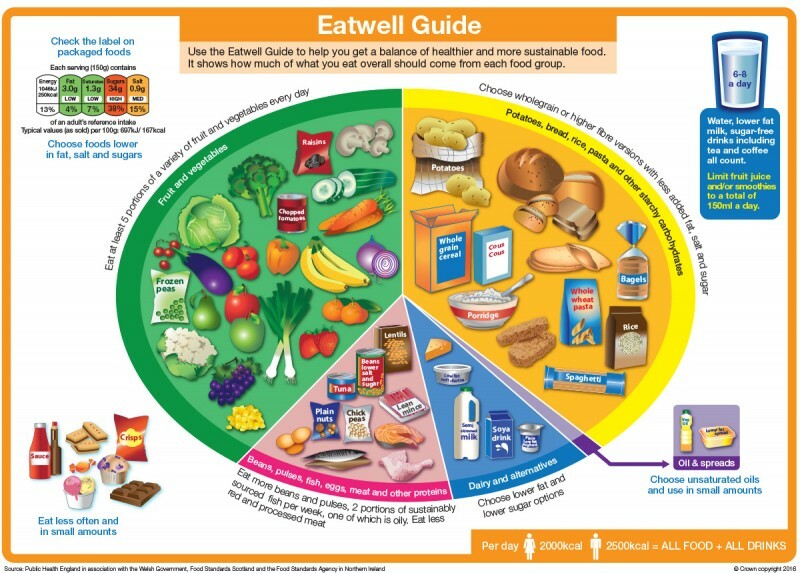 The proportion of different foods on this ‘plate’ (above) shows what is recommended. Red meat contains heme iron, saturated fat and some sulphur, which can all promote cancer in the cells of the bowel. Processed meat like ham, sausage or salami will have even more salt, sulphur and saturated fats. This is why eating protein from chicken, fish, beans and eggs is healthier than red meat. One of the most exciting recent advances in cancer prevention is that taking aspirin regularly can significantly reduce the risk of cancer, particularly bowel cancer. Over 100 studies have found a significant reduction in cancer in long term regular users of Non-steroidal anti-Inflammatory drugs (NSAIDS) including aspirin. Now there is agreement amongst medical experts that aspirin should be recommended to people at high risk of bowel cancer. However, daily aspirin is associated with a low risk (0.1%) of gastric ulcers and gastrointestinal bleeding; these risks tend to be greater the older you get. This means that if you are thinking of taking regular aspirin it is wise to check with your GP first. 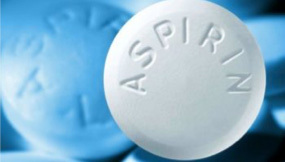 There is currently research taking place to find out the best dose of aspirin through the CaPP3 study. 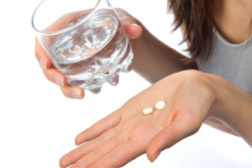 See the CaPP3 website for more information about aspirin and risk reduction. The CaPP study founder Sir John Burn has written a leaflet explaining some of the evidence about aspirin and cancer reduction. There is strong evidence that drinking alcohol increases the risk of certain types of cancer, particularly bowel cancer. The type of alcohol in drinks is called ethanol, a chemical made when sugars are fermented. When ethanol is in the body it is changed into acetaldehyde. 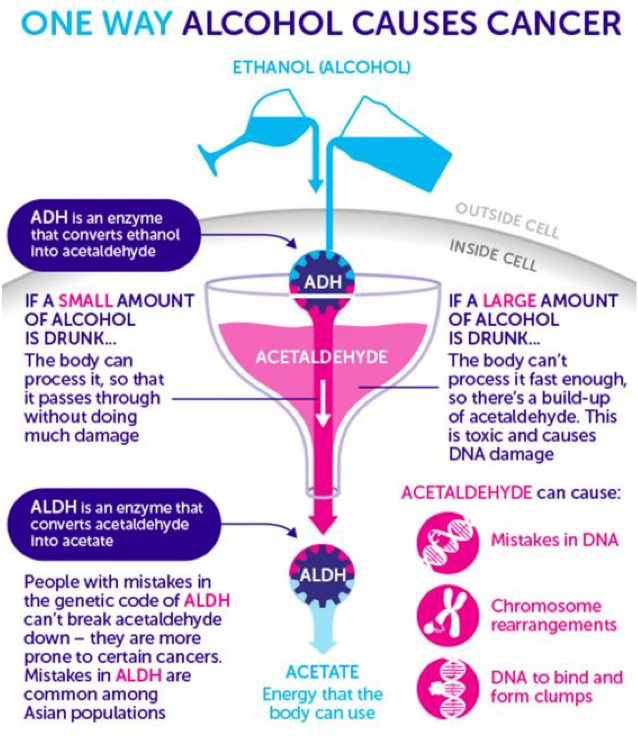 It is thought that acetaldehyde is toxic because it can damage DNA in cells. The damaged cells are then more likely to become cancerous. 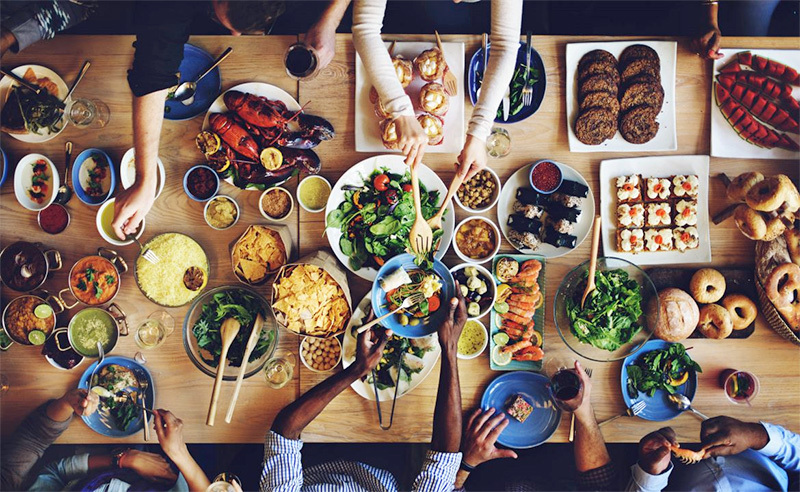 Unfortunately, people who have inherited an increased risk of bowel cancer seem to be particularly sensitive to food or drink that damages DNA. In Lynch syndrome, the gene alterations that are passed down are in DNA ‘mismatch repair’ (MMR) genes. Usually these genes help the body repair damage to DNA. If MMR genes are not working correctly in people with Lynch syndrome, then there is a greater chance that cells with damaged DNA become cancerous. The good news is that adopting a healthy lifestyle can have really significant benefits for people with a genetic risk of bowel cancer. Firstly you need to know whether bowel cancer screening is needed. If your relative has a letter explaining the advice they had, this can be a useful document to take to your GP. If you are aware of your family history of cancer but have not yet seen a specialist yourself, you will need to ask your GP to refer you. You might need to see a genetics specialist or be seen by a specialist doctor or surgeon who can arrange screening for you. It is important to be seen by a genetics team if there is a genetic alteration in the family. Your local genetics team can be found by looking at the British Society of Genetic Medicine website. This is because the genetics team can arrange a genetic test to find out if you have inherited the risk of cancer or not. If you have not inherited the gene alteration you may not need to have colonoscopy. The predictive genetic test is usually done on a sample of blood (or sometimes a sample of spit) but can only be offered if a gene alteration is already known. Screening for bowel cancer is very effective. Screening is usually done through colonoscopy where a tiny camera on the end of a flexible tube is passed into the bowel through the back passage. If any growths or polyps are seen they can often be removed at the time of colonoscopy. This prevents growths from getting any bigger and stops harmless polyps turning into cancers. There are studies that show how colonoscopy has improved the outcomes for people with cancer and reduced the number of cancers in people at high risk. Taken from Cancer Research UK, more information available through their website. Regularly checking the inside of the bowel by colonoscopy is advised for people who are well and have no symptoms but are living with a higher risk of bowel cancer due to their family history of cancer. How often the colonoscopy is done will depend on the number and age relatives were when they had cancer. Having a close blood relative who was diagnosed with bowel cancer under the age of 50 is something suspicious of a higher risk of cancer. The West Midland's Regional Genetics Service have made a good summary of bowel cancer surveillance guidelines showing how often screening is advised, which is available via their website. This is a common concern for people when they learn that there is a genetic vulnerability to cancer in the family. In fact, how insurance is affected will depend on several factors. In principle, any existing insurance policies will not be affected, as long as you answered all questions truthfully when you took out the policy. In the UK, an agreement exists within the insurance industry where insurers have said that they will not ask for the results of predictive genetic tests (tests for those who have not had cancer, to see if they have a gene alteration). Insurers still need to have access to relevant health information in order to calculate risk of illness. Therefore, insurers can still ask for the results of diagnostic genetic tests (tests for those who have had cancer, to see if they have a gene alteration) for new insurance policies for life insurance, critical illness cover or income protection. This is because they are part of that person’s medical history. about your predictive genetic test results when you are applying for income protection cover or critical illness cover. About predictive genetic test results in other family members. For more detailed information about this see the Genetic Alliance UK website. You must answer fully and correctly any questions in a new policy application, otherwise that insurance would not be valid. The insurers will take into account your family health history when considering your application. If you have had a negative predictive test, which shows you have not inherited the familial genetic alteration, then you may wish to tell the insurer. This could then lead to a reduction in what you pay as it will show you have a lower risk of cancer than your family history indicates. The Royal Marsden Hospital have a good leaflet about genetic testing and insurance (see below).